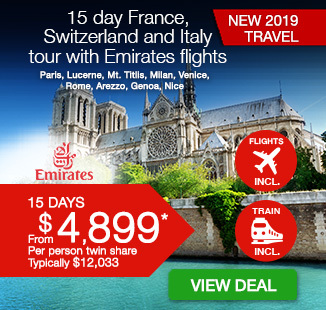 16 day European Whirl tour with Trafalgar, including return international Emirates flights, airport transfers, breakfast daily, escorted tour guide throughout, dedicated, air-conditioned transportation, in-depth sightseeing and more. Experience the best of Europe with an amazing 16 day European Whirl tour. Arrive in busy London and board the Eurostar headed for the Dutch capital of Amsterdam. Travel through the lush landscapes of The Netherlands and Germany, before boarding a cruise along the Rhine. Explore the baroque city of Heidelberg and journey to the Bavarian capital of Munich. Drive across the Austrian border to the capital of the Alps, Innsbruck and admire the incredible architecture of the Old Town and Emperor Maximilian’s famous Golden Roof. Wander the enchanting city of Venice and cruise along the beautiful lagoons and canals. Visit St Mark’s Square and immerse yourself in the rich Italian culture. Unearth the magnificent city of Rome, admiring it’s iconic sights including the Colosseum, Vatican City, the Spanish Steps and more. Drive through the picturesque town of Florence to reach the snow-capped Alps of Switzerland. Wander the medieval lakeside city of Lucerne and walk along the flower-lined 14th century covered Chapel Bridge. Arrive in the city of love, Paris, and explore the incredible Arc de Triomphe, the Eiffel Tower and Place de la Concorde. Journey back to London before your flight home. Depart Australia today to begin your European Adventure. A brief interlude with the British capital this morning sees us meet our Travel Director before travelling to London’s St. Pancras International where we will board the Eurostar™ for a high-speed train journey to Brussels and a luxury coach journey to Amsterdam. Enjoy an orientation of this historic Dutch capital centre before joining your fellow travellers and Travel Director for a Welcome Reception dinner cruise on its charming canals. Crossing the Swabian Alps on the edge of the Black Forest, we arrive in the Bavarian capital of Munich. Our orientation drive takes us past the Olympic Stadium and neo-Gothic City Hall, which dominates the Marienplatz. Driving across the Austrian border, we arrive in Innsbruck, the capital of the Alps. Admire the Gothic, Renaissance and Baroque architecture of the Old Town, including Emperor Maximilian’s famous Golden Roof with its ornate façade and perhaps consider an evening of traditional Tyrolean entertainment to soak up the sights and sounds of this region. Optional Tour (additional cost applies): Tyrolean Evening With Dinner. You’ll enjoy a delicious meal of traditional Tyrolean cuisine before a lively folklore show, where singers, dancers and musicians dressed in national costume provide an evening of entertainment and fun. Drinks are included. 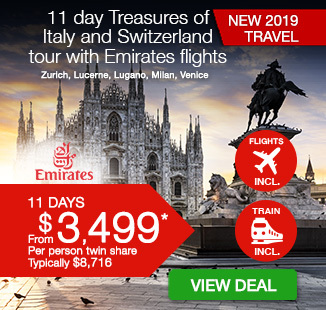 Meandering through the emerald-green landscape along the Brenner Pass, we journey into Italy and across the Dolomite Mountains en route to the enchanting city of Venice. We cruise on the beautiful Venetian lagoon by private launch to the gateway of Venice, St. Mark’s Square, viewing the ornate Doge’s Palace and the Bridge of Sighs, so named for the sound made by condemned prisoners as they look one last longing look at their beautiful city before meeting their fate. We gain a fascinating Cultural Insight into the centuries-old craft of Venetian glassblowing before spending the afternoon at leisure to soak up the romantic atmosphere. Get lost in Venice, cross bridges and discover hidden campi where locals share their daily stories over a glass of Venetian Spritz. Optional Tour (additional cost applies): Gondolas & the Grand Canal. On arrival in Venice, a private boat will be waiting to take you to St Mark’s Square, where you’ll enjoy a gondola ride while being serenaded by local musicians. Later, private water taxi’s will take you along Venice’s Grand Canal, where you’ll admire the magnificent palazzos and Rialto Bridge. Optional Tour (additional cost applies): Roman Evening with Dinner. This easy-going evening in Rome begins with a beautiful drive to see amazing city sights. We arrive at one of our favourite restaurants, where you’ll enjoy a warm welcome and delicious dinner of local cuisine with drinks and music. We venture to the Vatican City, visiting St. Peter’s Basilica with a Local Specialist to view Michelangelo’s Renaissance masterpiece, the Pietà. We journey to Ancient Rome to view the iconic Colosseum and Circus Maximus, once the site of exhilarating chariot races centuries ago. The afternoon is yours to explore the city on your terms. Sit on the Spanish Steps savouring a tasty gelato, shop up a storm on the trendy Via Corso or perhaps join an Optional Experience to see the magnificent frescoed ceiling of the Sistine Chapel. Optional Tour (additional cost applies): Piazzas and Fountains of Rome. Discover the most charming areas in the city with a Local Specialist. Wander through the labyrinth of narrow streets and beautiful squares of Rome’s historic centre, leading to highlights such as the Trevi Fountain and the Pantheon, as well as hidden corners of the Eternal City.Optional Tour (additional cost applies): Lagoon Cruise to Burano with Food and Drinks. Join us as we discover the Venetian Lagoon by private boat. You will enjoy a delicious meal with a selection of drinks on the fishermen’s island of Burano, famous for its multi-coloured houses – a real photographer’s paradise. Optional Tour (additional cost applies): Explore Ostia Antica. Join us on a journey along the Mediterranean coast and visit the excavations of Ancient Ostia, the former harbour of Rome. These ruins offer perhaps a more complete picture of Roman urban life than either Rome or Pompeii. See the remains of the baths, theatre, apartment houses, drinking room, mosaics and wall paintings at this beautiful site, mirrored by cypress trees and umbrella pines. Optional Tour (additional cost applies): Inside The Vatican & Colosseum. We skip the lines at the Vatican Museums for this tour that shows not just remarkable works of art collected and commissioned over the history of the Papacy, but also Michelangelo’s amazing ceiling frescoes in the Sistine Chapel. Later we hear fascinating tales of gladitorial combat and more on our visit to the Colosseum, again with time-saving VIP entrance. Optional Tour (additional cost applies):Roman Delights With Dinner. Spend an evening getting to know Rome. We’ll take you via coach where you’ll have the chance to see some of the city’s much-loved sights. Afterwards, you’ll enjoy a delicious light dinner of Italian specialities, alongside local music and drinks. From Rome, we travel north through the rolling countryside of Tuscany and along the Arno valley to the Cradle of the Renaissance, Florence. Delve into the rich Medici heritage of this beautiful medieval city with your Local Specialist. Visit what was once the political hub of the city, Piazza della Signoria, with its impressive sculptures and stunning palazzi. View the imposing Duomo with its Brunelleschi dome and Baptistery renowned for its bronze doors filled with relief sculptures. Learn about the quality and workmanship of one of this city’s historic industries at a demonstration of Florentine leathercraft. This evening, enjoy true Tuscan hospitality with a local family on their private estate on the outskirts of Florence. Optional Tour (additional cost applies): Michelangelo’s ‘David’ & Accademia. Enjoy an insight into the world of Michelangelo and his masterpiece, David. We visit the Academy of Fine Arts and its Michelangelo collection, where you’ll learn all about the life and works of this immortal Renaissance genius through the expert commentary of our Local Specialist. Drive via the picturesque Italian Lakes District, across the snow-capped Alps into beautiful Switzerland where we’ll spend the next two nights in the beautiful medieval lakeside city of Lucerne. Optional Tour (additional cost applies): Swiss Folklore Evening And Dinner. Tonight we’ll enjoy a tasty Swiss meal, including the famous Swiss cheese fondue, in a typical restaurant. While enjoying dinner, you can also join in a lively folklore show which includes yodelling, flag-throwing and Alpine horn-blowing. Two drinks are also included. Optional Tour (additional cost applies): Mount Pilatus And Lake Cruise. We’ll ascend by cog-wheel train to Mount Pilatus’ summit, where you’ll have time to explore, admire the views, and breathe the pure air. Then, we’ll descent by cable-car to enjoy a scenic lake cruise. On certain departures this Optional may be operated in reverse. Optional Tour (additional cost applies): Swiss Countryside & Carriages. A chance to get to know the Swiss, you’ll meet local farmers and enjoy a delightful countryside tour in horse drawn carriages. Soak up the stunning scenery as we trot around a typical rural community, en route to a working farm where you’ll savour local drinks and snacks. Optional Tour (additional cost applies): Moulin Rouge Cabaret And Dinner. Enjoy dinner and cabaret, including wine and champagne, at the world-famous Moulin Rouge – the original Paris cabaret. Immortalized by the award-winning film of the same name, this Parisian institution features 60 dancers and entertainers and over 1000 costumes! Optional Tour (additional cost applies): Nouvelle Eve Cabaret And Dinner. One of the oldest and most elegant revue theatres in Paris, Nouvelle Eve is a hidden gem, where you’ll meet the Director and two of the cast members before enjoying a four-course dinner with wine. You will then experience unparalleled Parisian entertainment – including the world-famous Can-Can. Optional Tour (additional cost applies): Notre Dame And Latin Quarter. A guided drive through Paris’ bohemian Left Bank with our Local Specialist brings us to amazing Notre Dame to discover one of the world’s most famous Cathedrals and the epitome of Gothic architecture. Afterwards, take a stroll through the delightful Latin Quarter, a medieval maze of winding cobblestone alleyways where you’ll have free time to enjoy the sidewalk bistros, boutiques and hidden squares. Optional Tour (additional cost applies): Seine Cruise And Paris Illuminations. Paris at night is a city transformed. Enjoy this superb ‘City of Light’ on a leisurely cruise along the River Seine. Afterwards, as we drive through this amazing city, we’ll stop at some vantage points for you to capture the fascinating sights on camera. In summer, this trip may take place before sunset.